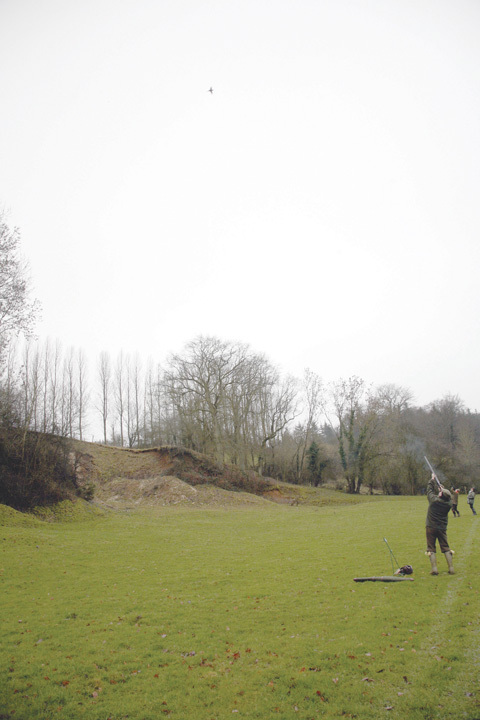 Pheasant shooting: There are certain things one associates with our nearest and dearest European cousins: Gauloises cigarettes, fine wine, gastronomy and flair on the sporting field. But the French are also a nation of hunters. Numerous writers have dispensed tales of boar hunting in these very pages, of whole villages stalking out into the woods gun in hand. However, one thing I have never associated with Gallic hunting is a passion for driven pheasants. My shock, then, when I took to the field with a team of French, Belgian and Dutch sportsmen on a cold, rainy January day last season for a day of startling familiarity, must have been palpable. Being just a few miles inland from the north Normandy coast, around eight miles from Dieppe, my surprise at the type and quality of pheasant shooting presented by Olivier Wallaert and his team was certainly misplaced. Le Comte provided a challenging start to the day’s pheasant shooting. The English share much history with the people of this part of France, and given the region’s proximity to our shores it seems obvious in retrospect that our favourite pastime should have made the short trip across the channel. “There are not many driven shoots in France,” Olivier tells me. “There are a few but not so many as in England, of course. We consider England as the specialists for this type of pheasant shooting, so I am very proud to have English customers. Thankfully, Olivier, who hosted the day in a wonderfully relaxed fashion, speaks excellent English. A 10-year-old GCSE in French will get you so far on your travels, but you might struggle to learn about the intricacies of producing high pheasants in steep wooded valleys. As you would expect, the beating team are an experienced and hardy bunch. The assembled group of guns were keen sportsmen, travelling far from home where hunting is either banned or very strictly controlled. No matter the language, the excitement in the air for a day’s pheasant shooting was unmistakeable. The fifth of six children, Olivier and his siblings were left Mahomet by his parents, who first bought the property in 1937. Thanks to the sale of a successful business, Olivier was able to buy his siblings out. Mahomet is a very striking building dating from 1610, its bold courses of red and white bricks sitting at the end of a long drive. 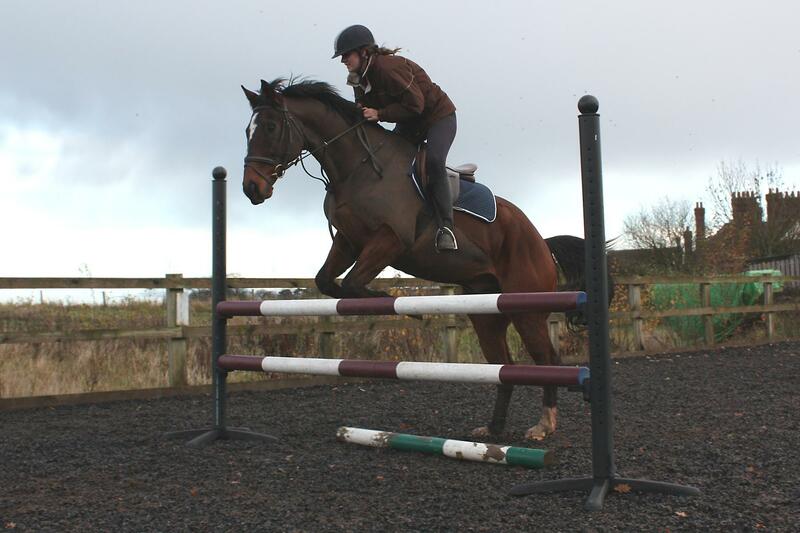 Much of the estate is given over to a successful riding school and stables, but none of the land is farmed so as not to impact on the pheasant shooting. For Olivier, Mahomet is an escape from city life, since he spends much of his time living and working in Paris. It is clear he takes great pleasure in running a shoot, and that this group of sportsmen should regularly travel from far afield to shoot with him speaks of his success. Olivier is aware that much of the success of any shoot day is down to the atmosphere. With that in mind, the day at Mahomet has a leisurely start of 10am, giving the guns (“fusils”) plenty of time to shake the cobwebs off from the warm hospitality the night before. 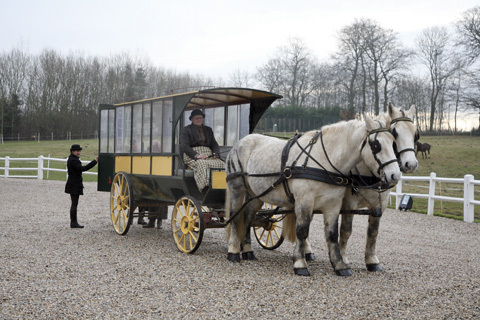 While Olivier travels around the shoot in a well-worn Land Rover, the guns are taken around on a horse-drawn carriage. The guns use an unusual mode of transport when shooting at Mahomet. This desire to create a relaxing atmosphere even extends as far as refusing to use walkie-talkies on shoot day, Olivier preferring to plan for the day well in advance and then taking care of the guns rather than barking at the keeper. The quarry on offer on the day of my visit was pheasant, though both redleg and grey partridges are also shot on the estate. Mahomet’s entire 200 hectares are managed for game bird shooting. Forestry work, for example, is carefully managed, right down to the varieties of trees planted. Almost the entire pheasant shooting territory is surrounded by high fences which allow the birds to roam, but ensure foxes, boar and deer have no chance of disrupting release pens or feeding sites. Fruit from the trees is allowed to fall to the ground for the birds to feed on, and predator control is carried out two to three days a week. “We have about 10 drives across the estate, and shoot five each time we have a battue. I choose which drives we will shoot in the morning according to the wind and conditions. 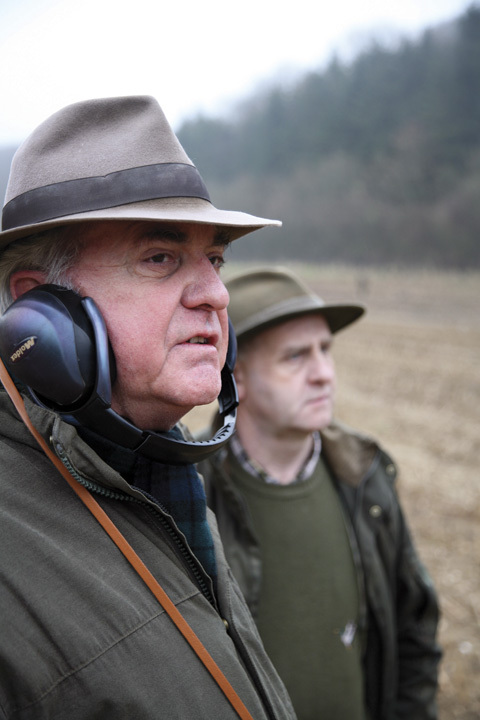 Owner of the shoot and keen sportsman Olivier Wallaert keeps a close eye on the day’s pheasant shooting. Knowing which drives to shoot comes from experience and close knowledge of the ground, something learned from his father and a lifetime in pheasant shooting. 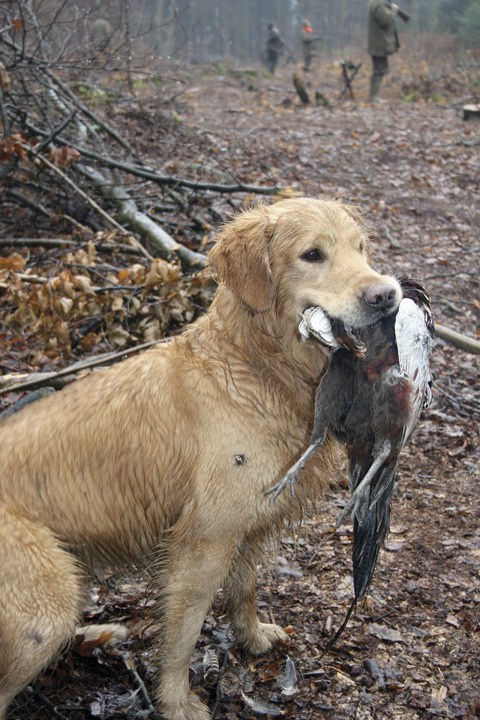 The pickers-up and their dogs worked hard in difficult conditions. A love for pheasant shooting and the countryside is evident in everyone involved at Mahomet, no more so than at lunch when I sat with some of the elder statesmen of the shoot. Though each party only spoke smatterings of the other’s language, there was real sense of camaraderie. A particularly rustic bottle with no label and an old claret cork stuffed in the neck was produced at the end of the meal and elicited great enthusiasm. When a sugar cube is dropped in your cup and a wizened voice asks ,“Un Calva?” you should not resist. It provided a particularly efficient blanket against the wind and rain. 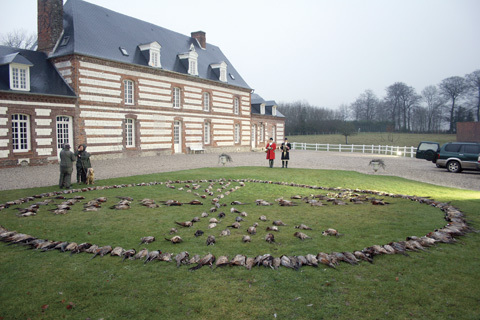 Though this was unmistakeably a French shoot, all the trappings of a day’s driven pheasant shooting in England were present: a grand house and grounds, teams of beaters made up of craggy old men and enthusiastic dogs, and exceptional hospitality. Not to mention the high, fast birds. A traditional ceremony in honour of the quarry took place in front of the house at the heart of the estate. Apart from the obvious language barrier, it is only a few French idiosyncrasies which would snap the English sportsman out of his reverie. The clearest example came at the end of the day, where a chance to warm the feet in front of an open fire and partake of a hot cup of coffee was broken by the tradition of saluting the game. Beaters, pickers-up and guns alike stood together in reverential silence as the game was laid out on the ground in a striking pattern and two local huntsmen, dressed in all their finery, played a multitude of melodies on their traditional horns. There is something particularly evocative about this ceremony and, I am sure it is something many sportsmen would welcome on British shoots. It marks a definite end to the day, and ensures the guns show proper respect not only to the birds they have shot but also to the beaters, pickers-up and keepers who brought the birds over them.